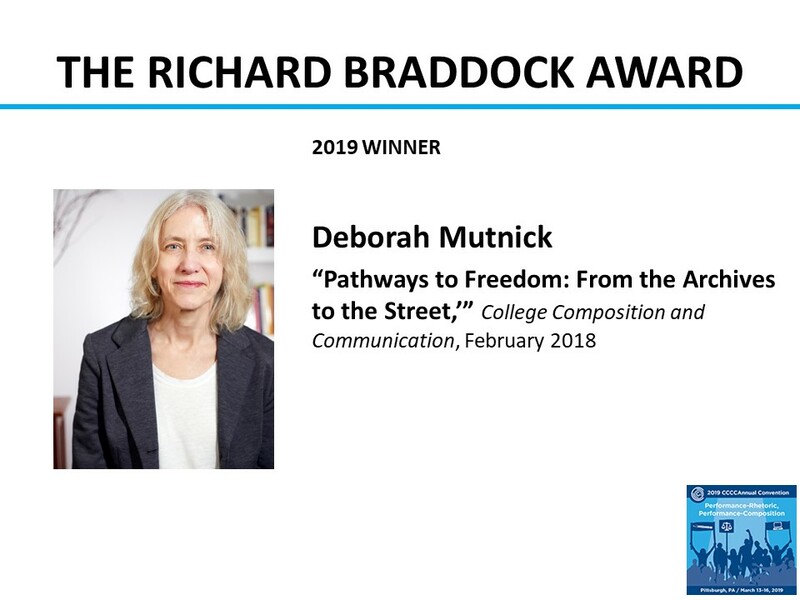 Purpose: The Richard Braddock Award is presented to the author of the outstanding article on writing or the teaching of writing in the CCCC journal, College Composition and Communication (CCC) during the year ending December 31 before the annual CCCC Convention. The award was created to honor the memory of Richard Braddock, University of Iowa. Richard Braddock was an extraordinary person and teacher who touched the lives of many people in ways that this special award established in his name can only suggest. Eligibility: CCC articles published in 2018 will be eligible for the award in 2020. Award Specifics: Because the Braddock Award committee considers all refereed articles published in CCC during the calendar year preceding the presentation of the award, nominations for this award are not accepted.